In the last episode, Connell, Veronica, Sanji, O’Doyle and Lybrand barely escaped with their lives, rescued by Angus and Randy. But Mack Hendricks wasn’t so lucky. The surivors are holed up in a cave, trying to figure out their next move. Meanwhile, Kayla Meyers has entered the tunnell system, trying to track down those same survivors … and kill them. Will she find Angus? The brand-new collection Hunter Hunterson & Sons War Journal Vol. 1 is available free as part of a no-risk, Audible Free Trial. It’s the BEVERLY HILLBILLIES meets GHOSTBUSTERS — monster stompin’ family fun with lots and lots of violence. Connell, Veronica, Mack, Lybrand, Sanji and O’Doyle are under attack, trapped on a ledge. On one side, a sheer cliff and certain death. On the other, a crawling army of monsters, steadly closing in. But there is a way out — Angus Kool and Randy Wright just dropped down from a place higher up the cliff face. Can they get Connell and the others off the ledge before it’s too late? Don’t see a “play” button above? Click here to download. This episode is also sponsored by our Audible Free Trial offer. Get a free audiobook as part of a no-risk, 30-day trial. Heck, you could get EARTHCORE and finish the book! Connell, Veronica, O’Doyle and the others are trapped on a tunnel ledge overlooking a vast cavern filled with the Rocktopi. On one side, a sheer rock face that ends in certain death hundreds of feet below. On the other side, a tunnel system teeming with creatures that want to slice them to pieces. Meanwhile, Kayla Myers continues her hunt for Angus Kool and Randy Wright, the two Earthcore scientists that have inadvertently sabotaged her efforts to return to the NSA. Will she catch up with them? And if she does, will the pliers come out? As the new year begins, we get back to our work routines, including shipping t-shirts and books to cool customers. It’s so easy thanks to Stamps.com and our Stamps.com promo code , you’ll never have to worry about these things again. Print genuine USPS postage with your computer and printer. Just stick it or lick it, hand it off to the USPS, and be on your merry way! Connell, O’Doyle, Lybrand and the others just endured a grueling, savage fight for life against the original occupants of the picture cavern. Deep in another part of the tunnell complex, Angus Kool and Randy Wright were dissecting a silverbug, trying to learn what technological secrets might be inside. And up on the surface, Kayla Meyers is ready to parlay the unimaginable discovery of the Funeral Mountain horrors into a shot at redemption, a shot at getting back her position in the National Security Agency. Will she once again represent the USA? New year, new credit! Looking for a thriller to take my mind off the cold weather! 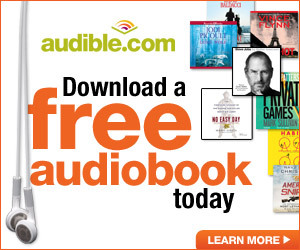 Try it yourself with the Audible Free Trial page! You could download EARTHCORE for free and hear the next 30 episodes without waiting 30 weeks! It’s a no-risk, 30-day offer. If you don’t like the service, cancel your account, pay nothing, keep the audiobook anyway. Bertha Lybrand is an army vet. She’s seen war. She’s killed men. But she’s never seen the horrors she faces now. She and Patrick must put their combat experience to the test if they are to survive what comes next. It’s kill or be killed. This is the first Sunday in a few months I can just watch football and not stress. My team is out of the playoff hunt, and my rookie QB has seemingly made it through the season without really significant injury. Plus, it’s way easier on my poor little heart to think about football and “Space Opera” like the ROOKIE! Follow the quest of Quentin Barnes as he travels the galaxy in search of the ultimate prize — the Galactic Football League trophy. The Blind Side meets Harry Potter, with aliens thrown in there for fun. Don’t wait, snag it now!